April 7, 2016 March 27, 2016 / Elizabeth T.
On days like this, where I’m just feeling super bleh, I tend to not really dress up because I don’t want to think too hard about what to wear, so I mainly stick with simple outfits that feel cozy. But comfort doesn’t mean we have to sacrifice style, right? The key to staying comfortable but still looking chic is to pick everyday basics that are embellished with small yet intricate details that set it apart from the norm. For instance, this sweater of mine is just a simple knit jumper from the front, but the sides feature crochet laced panels that show just a peak of skin without baring too much, and I love how soft and subtle it is 🙂 It makes for a great statement to an otherwise “boring” sweater and gives the whole ensemble a focal point. I love pairing simple loose-fitting sweaters with my favorite fitted denim because it helps to streamline the whole look, giving off a balanced silhouette. Rather than going for ankle booties, which I’ve been obsessed with as of lately, I decided to finish off my whole outfit with my favorite pair of shiny oxfords, making the cozy ensemble a little more polished and put together. Are you all as excited about the weekend as me? And how do you dress on your lazy days? Let me know if the comments below? I always love hearing from you all! You look lovely. The details to the top really interesting . I wonder if I could DIY that lace sweater… 😉 The shoes, I’ll just have to buy – love them! Hahaha that would be so cool, Clarissa! 🙂 I’d love to see a DIY version of this from you ❤ Thank you so much for stopping by love! Hahaha yes, weekends are what I always look forward to! 🙂 But sadly, they’re so short… Hehehe and thank you so much Nikolone ❤ Glad you like the sweater! Lovely shades. Thanks for sharing and check out 5 cool facts about an awesome eyewear designer. I love the lace details Elizabeth, and the shades looks so cute on you 🙂 i’m obsessed with fitted denim as well, i wear them all the time, weekend or not haha! have a great week! 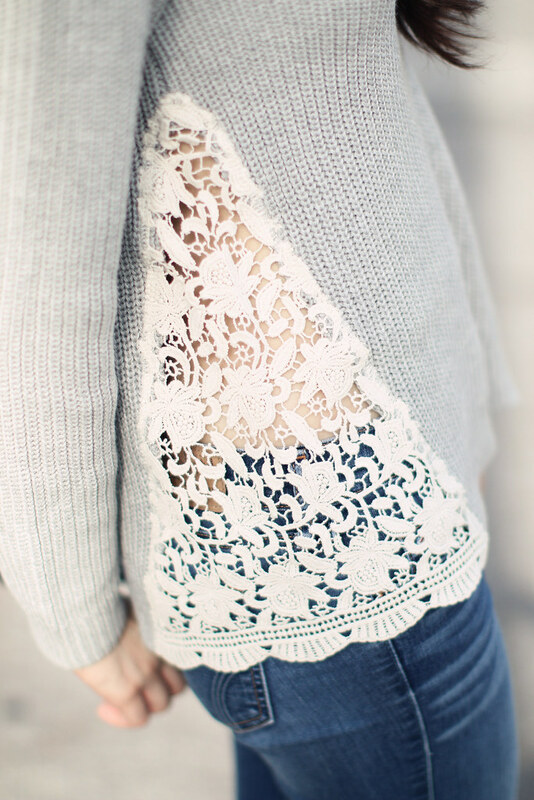 I love this knit the lace details!! I’m absolutely with you in terms of finding comfortable clothing which is simple but yet comes with special and intricate details. Agree that the shades look cute on you! I love that top! I really need to buy a few tops like it because I can wear whatever I want to work, but some days I just feel like being casual – but I can never find a pretty-yet-casual top in my wardrobe. You look lovely in the outfit! Casual dress code at work is the best, don’t you agree? 🙂 Haha thank you so much for stopping by Claire ❤ Glad you liked the outfit! Loving the sunnies. Thanks for sharing and check us out to learn how to get XTRActive. Absolutely love how you styled your jeans! Every single piece looks amazing! 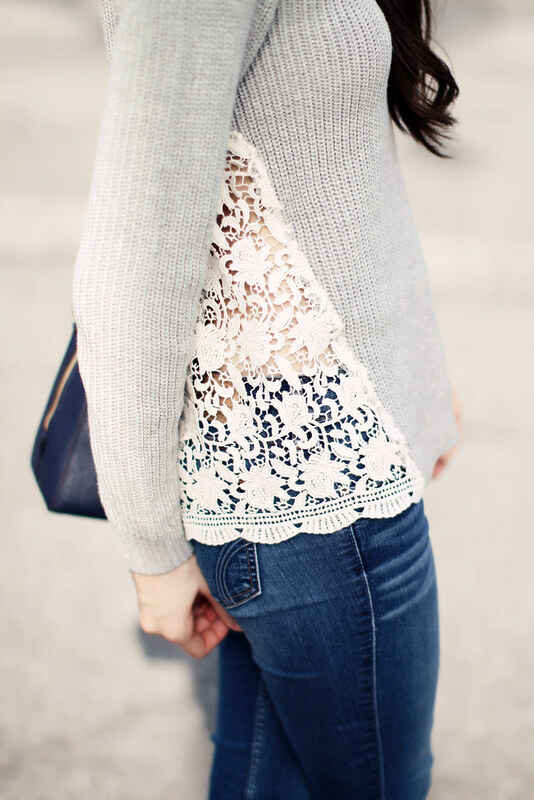 Aw I love the crochet detailing of the sweater and the shoes are adorable! Thank you so much Serein ❤ The detailing is what made me fall in love with it at first too! this is so off topic but have you ever dyed your hair elizabeth? it’s so silky smooth! pls do a post on how you take care of your hair! haha i seriously sometimes wanna shave my head so i can start fresh. my hair is like the saddest thing ever! Haha no, I actually haven’t ever dyed my hair Annie 😉 My natural hair color is a dark brown, so I never had to color it, since the summer sun always helps to lighten it. Thank you so much Lynne ❤ 🙂 You're too sweet! Glad you liked it love ❤ 🙂 Thank you so much for stopping by!